As I've mentioned, I'm a sucker for all things Christmas, so every day (from now till the holiday), I'm going to share something I love about this time of year. 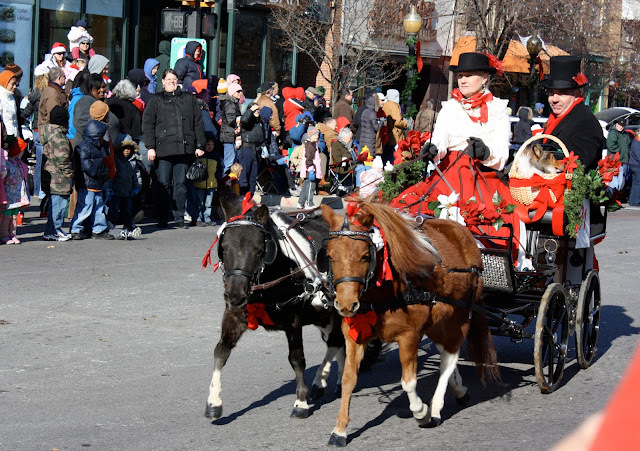 First up, the annual old-fashioned Christmas horse parade in my hometown. If I may point out, this picture contains: two miniature horses pulling a charming carriage, an old couple wearing old-fashioned garb and (if you look closely) a sleeping puppy in a basket. Cute overload! It's so sweet it gives me a toothache... That sleeping puppy just pushed it over the edge! that is so freakin cute! hi !!! from your newest " follower" who knew kansas was so flyyyyy !!!! oh goodness, a puppy in a basket! awesome!